Every chef I know has a book full of basic staples and secret one-off recipes they have picked up on their travels. I have come to realise that basic culinary skills and frugal food preparation have sadly diminished. Although there is a hunger for new knowledge and exciting, show-stopping tips. There is a real need for people to return to, real cookery. A time where most Mothers could not only make good food, but pass on skills such as pastry and pasta-making, simple braising and long-term storage of prized ingredients. Whilst there is now a deeper understanding of why we do what we do with food. And a huge evolution in the techniques used. I do not think the classics will ever fade away or the basics change beyond recognition. My own cookery training was forthrightly classical and the skills I was taught have been passed down over hundreds of years and are still used in professional cookery today. There is, as I’ve said, a difference between cooking professionally and cooking at home, but my aim has always been to bridge the gap by passing on the essentials required. I recently hosted a Masterclass Upstairs at Trinity. Here I had the opportunity to showcase some of my favourite basic techniques and accompanying recipes. We started the class off with a Fresh Tagliatelle with Wild Mushrooms and Pecorino, a dish that really hits the spot for me on just about every level. 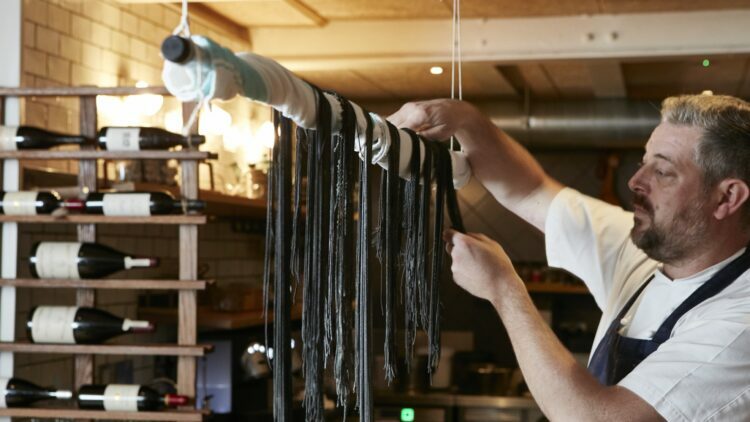 Nothing comes close to the taste and texture of fresh, silky, homemade pasta. This dish includes a fantastic pasta dough recipe. This is great for lasagne, spaghetti or linguini, as well as the tagliatelle used in this recipe. The pasta freezes well once made, or it can be cooked and stored in the fridge for a day. We then went on to another fantastic pasta dish, Spaghetti Vongole, which proved a great way to showcase the extent of culinary possibilities that come from working with a brilliant, yet basic pasta dough recipe. The class continued on with a brief demonstration in preparing Homemade Butter. A longstanding practice in both the kitchen at Trinity and my own kitchen at home. Making butter at home may not seem like a particularly great use of your time, considering the great butters that are now available to buy. However, this recipe for Homemade Butter is a great recipe to make with your children. And if – and only if – you take time to seek out fantastic cream. You will be amazed at the yield and overall flavour of the butter. You will get the best results using a really crunchy salt such as Maldon. Whether you are revamping your fundamental cooking skillset after a period of dormancy. Or delving into the basic staples of home-cookery for the very first time. Be sure to remember the end result should be as simple as the foundation these skills are built upon: the enjoyment of great food.